The Oscar-nominated French crime drama is planned for Blu-ray this August. 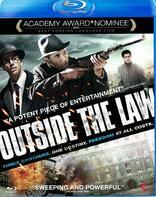 In an early announcement to retailers, Palisades Tartan is bringing 'Outside the Law' to Blu-ray on August 2. 'The film traces the life of three brothers whose family has been driven off its land and survived the Sétif massacres. They end up in France where two of the brothers campaign for Algerian independence. The Battle of Paris, which brings the FLN (National Liberation Front) into conflict with the French police, crushes and divides them. The Blu-ray will feature 1080p video, a DTS-HD Master Audio 5.1 soundtrack, and supplements include a making-of featurette, cast interviews, an interview with director Rachid Bouchareb, deleted scenes, and theatrical and teaser trailers. Suggested list price for the Blu-ray is $27.98. You can find the latest specs for 'Outside the Law' linked from our Blu-ray Release Schedule, where it's indexed under August 2.